Parts from a Fiat-Sero 1913 on a homebuilt chassis with a small Austrian Halling drive. 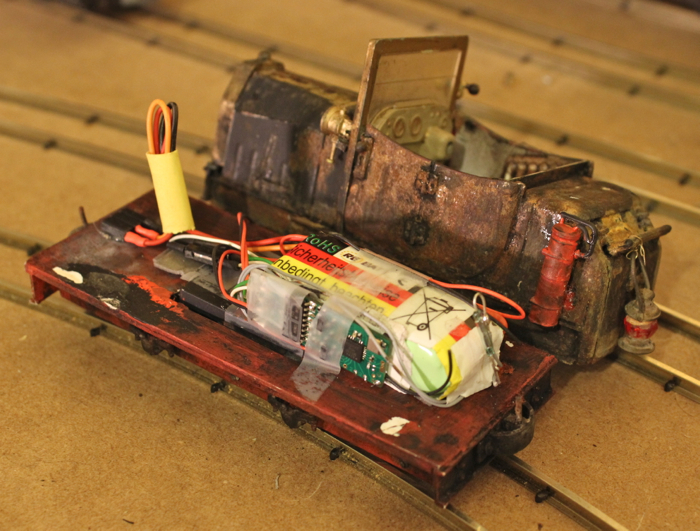 Those need very little energy, so a single Lipo cell will be enough to run this on batteries and a Deltang RC Unit. Enough room inside the model. At the moment it still runs with track power. The rail Fiat is 100 mm long. 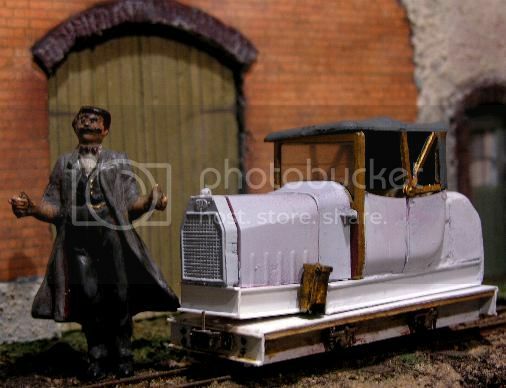 The body of a Ford T Runabout in 1 :24 scale is approx. 120mm long. Well, isn't that neat! Could you let us know what Deltang components you use please? I haven't ordered anything yet. My choice of Deltang components for my models will not really help anybody else. Simply ask David from Deltang what you intend to do and he´ll advise you. Bob Roegge recentltly showed here a test rig up which is a very good help for absolute beginners to get the basic idea. Last edited by Chris18 on Fri Dec 19, 2014 8:26 am, edited 3 times in total. disturb the flow of a building thread. Anyway, I applied some paint and found a driver. 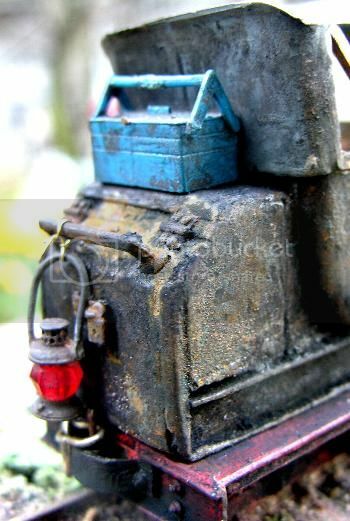 Have to find some details like door hinges and knobs, lamps, battery, toolbox etc. now, before giving it some weathering. Nevadablue wrote: ...Could you let us know what Deltang components you use please? I haven't ordered anything yet. Having equipped several Gn15 locos now with different of Davids Rx's, I have to say that the features of the Rx62, to switch a loco on and of with a Reed switch or to switch it off with a button on your Tx are very sophisticated and comfortable. Also the LVC (Low Voltage Cutoff) of this receiver is able to cut connection between Rx and battery completely. So that there is no quiescent current that can drain and damage your Lipo battery if you forget to switch your Loco off. Will be interesting to equip this little vehicle and to find the lipo that offers the best compromise between size and capacity. Anyway, they can write their comments if they want to. This forum is a free world ! Nevadablue wrote: Well, isn't that neat! Could you let us know what Deltang components you use please? I haven't ordered anything yet. In the US there are several sources for Deltang stuff. I have had good luck with the ON30Guy. He has a direct connection with the Brit supplier and really knows his R/C. I'm doing all my GN15 locos with this little radio and will use a flatcar or orecar to carry the Batts and receiver so I can avoid buying a receiver and battery for each loco. I should get by with 2-3 total receivers. 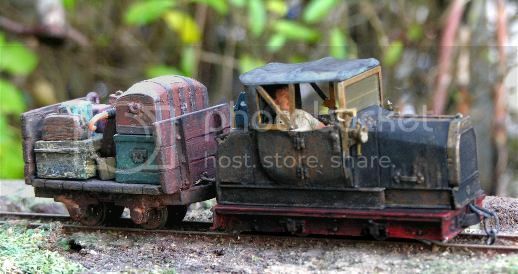 Back to the topic I will see if I can make a railcar like the ones shown here with my AMC Model T. It has been sitting around for about 15 years in it's box. Added some Details, mainly OZARK parts and startet some slight weathering. 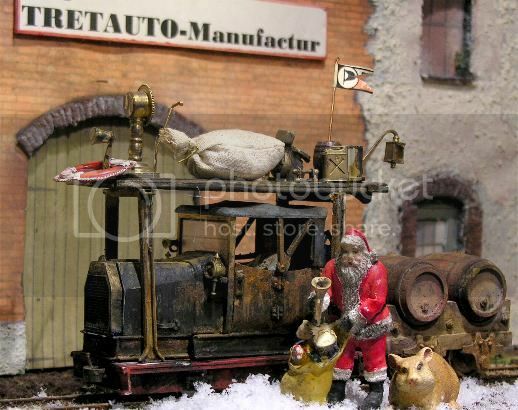 Right after Christmas the Fiat will go over to the Toeffelholm Workshops, to get the Lipo and Deltang RC installed. You won't regret the radio stuff. I got a note back from David at Deltang. He recommended the Rx60-22-W receiver for the T22 controller I want to get. I may end up ordering directly from him since the ON30Guy doesn't seem to have stock. I'll update later in my own thread. That railcar is "the bee's knee's" KEG. 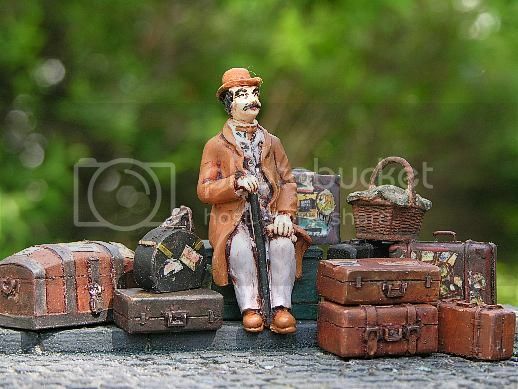 Is the luggage on the flatcar commercial or did you scratch build that too? Also the weathering is superb, as usual. Found the hotel stickers at the net. Before WW II they were very popular all over the world. 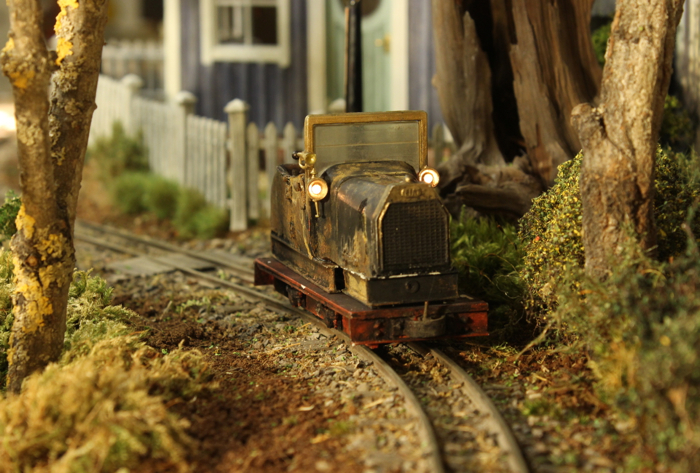 It looks, as if he is on its way to the Ravenglass & Eskdale festivies next year. Delivering some better hard stuff. Juergen, you and Hermann always make me smile. Thanks! Merry Christmas! It is snowing here again, so it looks like tomorrow will be a White Christmas here. Great work, Toeffelholm-Juergen. I love the tiny lightbulbs inside the coach lanterns. Can´t wait to get my hands on the speeder again. Suppose, with two lipo cells it runs quite fast. 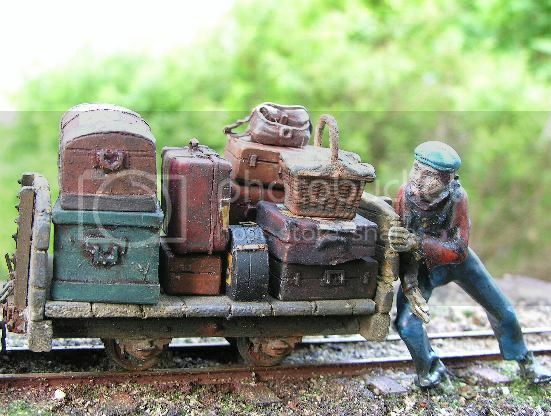 Very nice rail car Juergen. The layout is superb too. That is great packaging of the radio gear, Juergen, and great work as usual on the build. I'm fighting with using a steel sided car to haul batteries and the charging wires, but the connectors are a bit too big. I'll keep working on it. Used a small Schomberg Models Gn15 flatcar as a base. Filled the underside with sheet lead for weight. Before that, the stiff cables tended to derail the tender. More of Juergen Toeffelholm´s Deltangisation work on Gn15 models can be seen here. http://www.die-feldbahnsinnigen.de/forum/viewtopic.php?f=61&t=1017&p=8949#p8949 I think, we have 8 Deltang RC / Battery locos running at the moment. Thanks Juergen for the ideas for installing the Deltang stuff. I have only bought 1 receiver so far and the running is great on 3 different locos. Pictures to follow in my own thread so I don't mess up yours. Thanks you Jeurgens, for the ideas and great pictures. Doc, please start a thread on your installs. I need some help too. 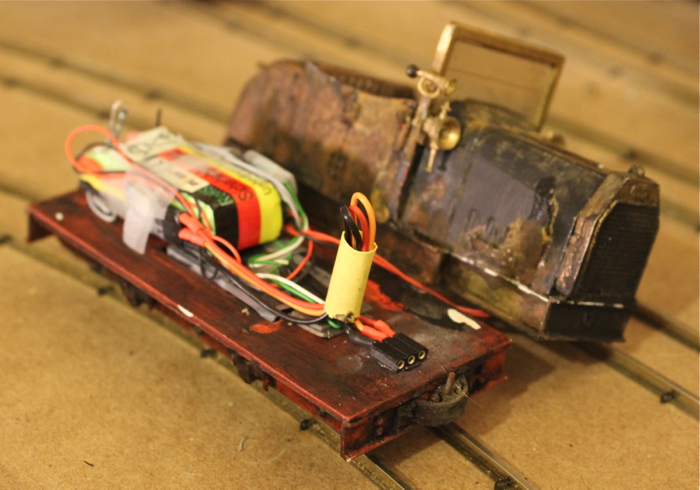 I will have only one receiver for a while and have some ideas for making it 'plug and play' in multiple locos. Nevadablue wrote: Thanks you Jeurgens, for the ideas and great pictures. I have been fighting with reverse loops but tomorrow I'll post my mining car that has the radio in it. I think Juergen's installs are really the way to go. He has the connectors tied down so all you see is the wires. I glued one connector to my railtruck but it did not stick out enough to connect properly. I am using Dean's Microconnectors but there are smaller ones from the sub-mini R/C airplane community. I don't think my vision is good enough to see these little 2 mm ones. I'm not sure that the radio stuff shouldn't have it's own thread, but all the models we are talking about here have radio or plan to. So here goes nothing. I need to tie down everything in the trailing car and cover it with a tarp. Juergen has everything taped and secured and has the connector also attached inside. I also tried polarize connectors but using the small 3 way ones with only 2 connections would probably work better. Either way the battery will only work one way, but the motor connection could go either way. Additionally I am experimenting with reverse loops with no switching points and very small radius as well. Not a smart way to get at least 1 good result. I am losing the 5" radius first as there is no way the railcar will work. 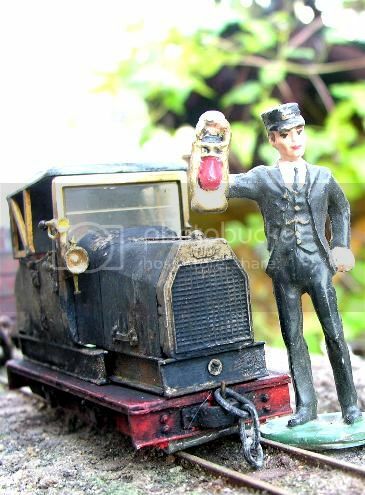 I do have a Bachmann tiny motor unit from the old GE diesel 44 ton which has a very small radius. To sum up, the radio works great but everything else needs a rewrite.